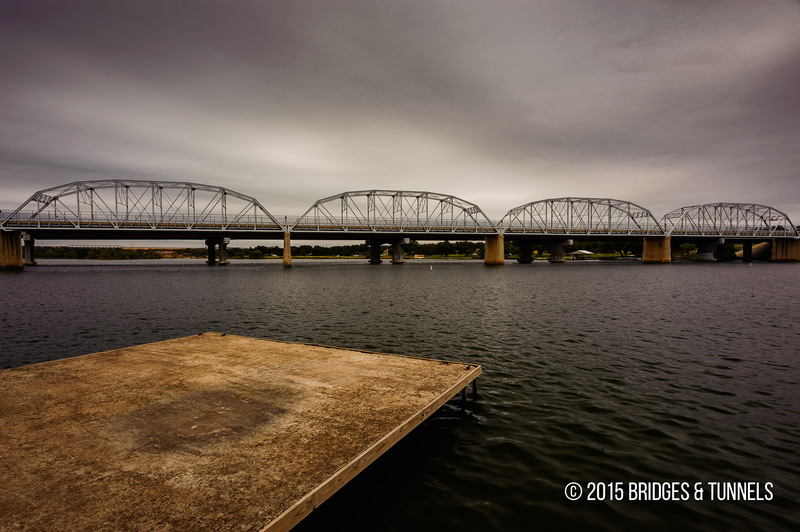 The Buchanan Dam Bridge is located along former TX 29 and crosses the Colorado River between Burnet and Llano counties in Texas. It was bypassed in 2003 and the crossing is now open to pedestrians. Initial planning for the Colorado River bridge came in 1929 when the Texas Highway Department was studying various routes for TX 29 in the Hamilton Dam region.1 The dam’s construction was not yet underway, but the THD understood that the existing roadway would be underwater by 1937. In September 1931, the state accepted $135,000 from the developers of the dam, Emery, Peck and Rockwood Development Corporation, which was slated for the highway’s eventual relocation.1 The money from the company was never fully remitted as just two months later, the corporation was sold to the Central Texas Hydro-Electric Company, a subsidiary of a large utility firm operated by the Insull brothers. The dam plans were revamped and the name changed to Buchanan Dam. The Hydro-Electric Company signed an agreement with the state in March 1932 to pay the earlier accepted amount, and a check for the first $5,000 was attached with the agreement.1 Two more checks were sent on the 10th of April and May of that year. Monthly payments of $10,000 were to be followed thereafter until the total $135,000 was paid. At around that time. Gibb Gilchrist, then the State Bridge Engineer, began requesting federal aid funding for the bridge’s construction and insisted that the plans be included for approval by the Bureau of Public Roads. This was done against the advise of the state highway department as the federal aid requirements called for a larger roadway width and a slightly different type of bridge design; the state was planning for a 20-foot width.1 In a March 10, 1932 memorandum, George Wickline, then the State Bridge Engineer, informed Gilchrist that engineers at the Bureau of Public Works would insist of a 22-foot roadway width. Gilchrist replied that he did not want to change the initial design of the bridge and wanted the chance to apply for aid to see if theBureau of Public Works would accept his insistence of a 20-foot roadway width. It is unknown if the reply was satisfactory. On April 20, 1932, the Hydro-Electric Company went into receivership and all work on the Buchanan Dam stopped.1 The payments to the state highway department stopped as well, as did further work with the bridge project. In 1934, the Texas Legislature created the Lower Colorado River Authority, and construction resumed on the dam in the following year. Planning work for the bridge began again in May 1935 when Gilchrist refused revisions to his bridge design who believed that if Bureau of Public Works funds were rejected that the $135,000 remitted from the Hydro-Electric Company would be sufficient.1 In a memorandum to Wickline signed May 21, Gilchrist insisted that there was no need to revise the plans and that the power company would submit the money. But D.K. 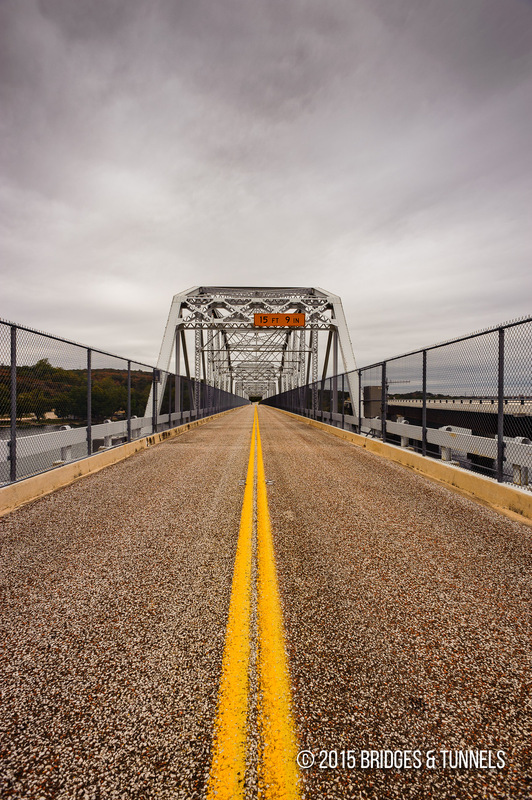 Martin, a Texas Highway Commissioner, believed that it would be tempting fate to issue a contract for the bridge’s construction until the state’s highway department had been paid the remaining $125,000. It is unknown if the money was ever submitted. In 1936, the state proceeded to redesign the Colorado River bridge to comply with the Bureau of Public Works. Federal aid was soon approved when the design reflected a 24-foot roadway width.1 Shortly after, the state’s highway department andBureau of Public Works engineers began surveying the site for an optimal bridge site and a location one-mile below the Buchanan Dam was selected where a granite outcropping on the proposed eastern approach made for an ideal location. In a preliminary inspection note signed July 17, aBureau of Public Works engineer stated that the bridge site was “clearly established by the terrain and surrounding country.” Favorable granite under the river also led the use of spread footing foundations, and piers were planned to be built at a 20-degree angle to minimize the force of floodwater and drift on the piers (lenticular nosing). Bids were released in November and a contract was awarded to the Austin Bridge Company of Dallas for $182,000 and construction began on February 4, 1937.1 The state chose to use four 200-foot riveted Parker through trusses built by the Pittsburgh-Des Moines Steel Company of Des Moines, Iowa that rested on solid, reinforced concrete piers and eleven I-beam girder approach spans fabricated by the North Texas Iron & Steel Company of Fort Worth that were placed on concrete bents. The railings were custom designed and were built of steel channel rails attached to curved-top posts. The posts were built from steel railroad cross ties that were modified by cutting, bending and welding them to form a curved top. Construction was completed on September 30, 45 days ahead of schedule, at a cost of $188,000.1 The federal contribution via the Bureau of Public Works was $94,000. The bridge was dedicated on October 16 as part of the dedication ceremony for the Buchanan and Inks dams. It included an address by U.S. Public Works Administrator Harold L. Ickes and Texas Highway Commissioner Robert Lee Bobbitt. The Colorado River bridge was added to the National Register of Historic Places on October 10, 1996.1 It was bypassed in 2003 with a 1,530-foot steel girder crossing. State Highway 29 Bridge at the Colorado River. Austin: Texas Historical Commission, 1996. Texas Historical Commission. Web. 5 Nov. 2012. Article. Adams, John A. Jr. Damming the Colorado: The Rise of the Lower Colorado River Authority 1933-1939. College Station, Texas: Texas A & M University, 1990. Austin Chamber of Commerce. Lakes in the Austin Area. Austin: Austin Chamber of Commerce, 1937. Banks, James H. and John E. Babcock. Corralling the Colorado: The First Fifty Years of the Lower Colorado River Authority. Austin: LCRA, 1988. “Dam Dedication by Ickes Planned for This Morning.” The Austin American, 16 October 1937, 1. Texas Highway Department. General Information on Texas Highways. Austin: Von Boeckmann-Jones, 1919. Texas Highway Department. Plans of Proposed State Highway Improvement. Control-Section-Job No. 0150-05-002, located at TxDOT headquarters in Austin. Texas Highway Department. Project Correspondence Files. Control-Section-Job No. 0150-05-001, located at TxDOT headquarters in Austin. Texas Highway Department. Project Correspondence Files. Control-Section-Job No. 0150-05-002, located at TxDOT headquarters in Austin.